Got a holiday cottage website already? Now you can add a holiday cottage on-line booking system to your existing website, complete with a comprehensive back-office, and the option to add on-line card payments too! We are web designers and web programmers based near St Andrews in Fife, Scotland. With nearly twenty years of experience in web design, web programming and Internet marketing, we have a wealth of experience that we can bring to the table, providing you with a business website that will work for you. 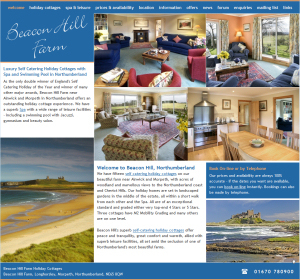 We are specialists in building holiday cottage websites with on-line booking and payment systems, but have designed websites in many other industry sectors, including education, estate agents, hotels, manufacturing, shops, solicitors, tourism and visitor attractions. Clean crisp simple website design with clean crisp graphics and optimised high quality images. Consistent and intuitive website navigation with no cul-de-sacs. Fast-loading web pages with minimum scrolling. Responsive design for mobile optimisation. Database-driven website design for dynamic content. Secure on-line control panel allowing clients the ability to easily and instantly update important content themselves. Automated control of date-sensitive data so that website content never becomes stale. Automated mailing lists and personalised mailshot facilities to provide two-way interaction with users. Search-engine-friendly website structure and design. Search engine optimsation, search engines submissions, website marketing advice and protection against junk-mail robots all as standard. Ongoing website maintenance and support. Browse our own website for more information and links to our extensive sample portfolio of websites we have designed.